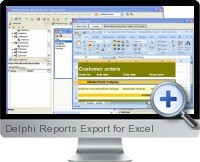 Delphi Reports Export for Excel is a powerful band-oriented generator of template based reports in Excel. The easy-to-use component property editors allow to quickly create powerful reports in Microsoft Excel. The report export component for Delphi can create reports, which can be edited, saved to file and viewed almost on any computer. The component supports Borland Delphi 5-7, 2005-2009 and MS Excel 97 SR-1 and above. Creating report templates directly in MS Excel. Saving template as in the external *.xls file, as in the *.dfm (.exe) file. Borland Delphi 5-7, 2005-2009, and MS Excel 97 SR-1 and higher are supported. Any data source can be used. Creation of master-detail reports and reports with grouping. Full integration with Delphi IDE. High productivity even on slow computers. Detailed help system and a demo application for a quicker mastering of the product. Powerful component and property editors, which allow you to set many report parameters at the design-time easily.